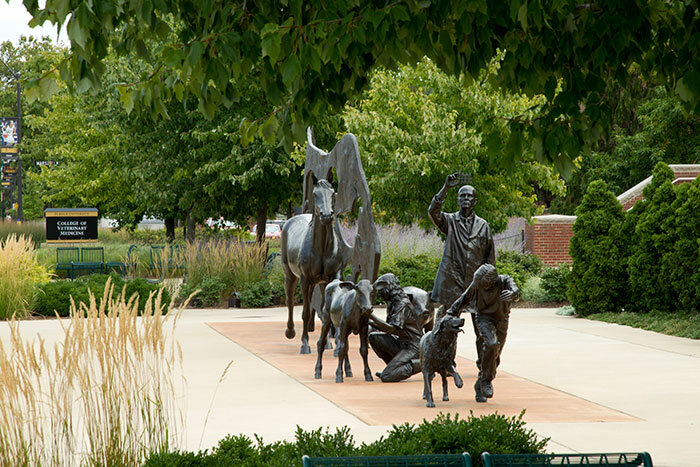 In conjunction with the American Veterinary Medical Association (AVMA) Convention in Indianapolis in July, the Purdue University College of Veterinary Medicine was featured in an article in the AVMA Convention Daily News publication. The article by Malinda Larkin in the Sunday, July 23 issue provided an overview of the College and highlighted some of its unique features. "Indiana's nearly 1,600 veterinarians are a close-knit bunch," Malinda wrote in the article. "A big reason why is the state's one and only veterinary college at Purdue University in West Lafayette, located about 60 miles northwest of Indianapolis." Malinda interviewed Dean Willie Reed for the article, and quoted him as emphasizing how the College educates the whole veterinary team, as one of only four U.S. veterinary colleges that offer both DVM and Veterinary Technology degree programs. The article also pointed out how Dean Reed has made a concerted effort to increase diversity and inclusion in the College and in the profession overall, noting that, in addition to increasing the percentage of underrepresented minority students, the College also has made great strides in recruiting and retaining female and underrepresented faculty. Additionally, the story emphasized how Dean Reed has put resources behind his goal to have every student travel internationally before graduating. Explaining that the College's latest strategic plan includes a greater emphasis on food animal medicine, the article further detailed how new faculty have been hired to better serve Indiana's rapidly growing animal industries in swine, dairy, and poultry. The story also pointed out how Purdue has increased its clinical services for horses with the dedication of the new Centaur Equine Specialty Hospital in April. On the same page in the newspaper, an article by R. Scott Nolen recounted the story of the Indiana State Veterinarian, Purdue Veterinary Medicine alumnus Bret Marsh (PU DVM '84). Headlined, "Indiana state veterinarian followed a different career path," the article explained how Dr. Marsh did not follow the mainstream when he took a job with the Indiana State Board of Animal Health as a supervisor/training officer for meat and poultry inspection after earning his DVM degree. "I was an anomaly for wanting to work in the public sector," the article quoted Dr. Marsh as saying. "Classmates told me I was throwing my degree away." But the story emphasized that things worked out in Dr. Marsh's favor, as 23 years later, he remains chief animal health officer for the Hoosier state and head of the BOAH. Click here to read both stories in the AVMA Convention 2017 Daily News Sunday, July 23 edition.